The team from the film fraternity expressed their strong support of the Prime Minister’s vision for making India a five trillion dollar economy in the near future. They presented an overview of the vast growth potential of the media and entertainment industry in the country, mentioning the contributions the sector has been doing so far. The delegation also pitched for lower, and uniform rates of GST, for the entertainment industry in India and strongly called for the development of Mumbai as the global entertainment capital, through various initiatives and proactive approaches. The Prime Minister observed that the Indian entertainment industry enjoys immense popularity across the world and it is one of the key elements of India’s rising soft power status, across the globe. He assured the delegation that the Union Government is supportive of the media and entertainment industry, and would consider the suggestions in a positive manner. It was inspiring for the film industry stalwarts to hear the PM’s views. 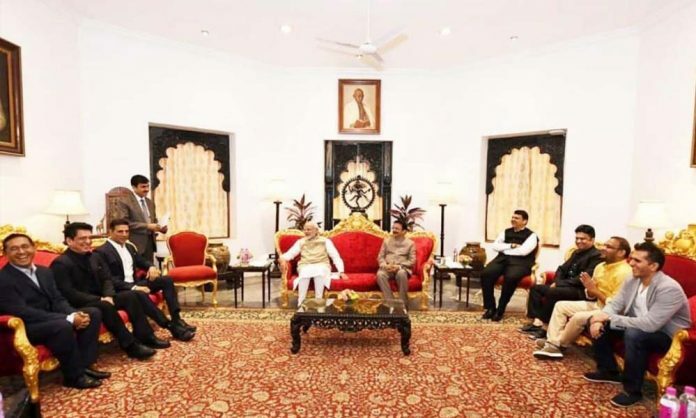 The delegation included prominent film producers such as Bhushan Kumar, Ritesh Sidhwani, Siddharth Roy Kapur, Rakesh Roshan, Ronnie Screwvala, Mahaveer Jain, Sajid Nadiadwala, Vijay Singh – CEO – Fox Star Studios and Prasoon Joshi, the chairman of the Central Board of Film Certification. Devendra Fadnavis, the CM of Maharashtra was also present on the occasion.